I’m a meat-lover, the idea of a meatless meal had never appealed to me. Yet last week WHO is pretty much suggesting meat causes cancer, not just processed stuff, even a good-looking dry-aged premium quality steak does no good to our bodies. I somehow find it hard to believe. Anyhow, Mama Chan is a fan of rabbit food, so treating her to some fancy vegetables makes sense. Joie by Dozo served modern vegetarian cuisine. I was skeptical, and I know Papa Chan would too if I had told him, so I didn’t mention ‘no meat’ to anyone. We were led to a private room overlooking the rooftop garden. The decor was not to my taste, the patterned lacquered walls, mini chandeliers that look decidedly acrylic, just look a bit cheap, trying-too-hard and outdated. It was okay by Asia standard. Service was excellent though. A refreshing passionfruit juice to whet our appetite. The carrot was presented to look like salmon sashimi; the texture was slightly crunchy with a sweet undertone behind the gentle acidity. The mild kick in the smooth horseradish cream masked the seaweed flavour well, so even Papa Chan ate his. My favourite was the raspberry compote, neatly contained in a thin jelly film and exploded its tangy sweetness in mouth. We all ordered something different from each section, so we could try more dishes. Though very pleasing to the eye, there was little surprise in terms of flavour, the powerful cheese took on the array of pairings. I liked it with black olives most, but obviously preferred it with Spanish bellota jamon. Oh sorry, no meat. 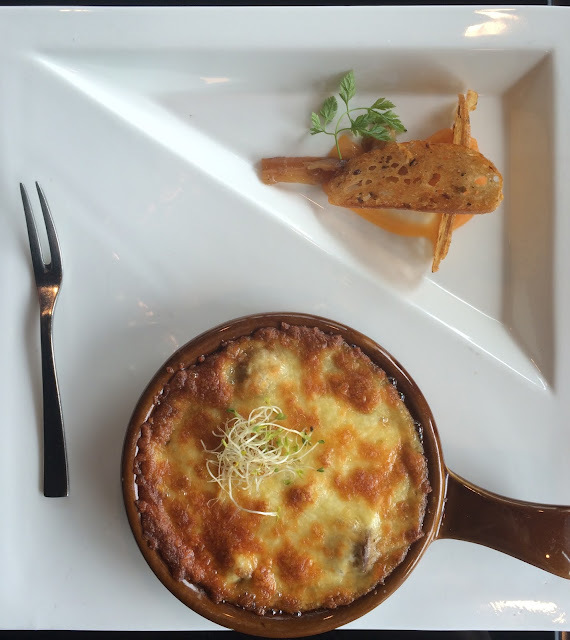 This wasn’t as exciting as it sounded on paper, it was baked cheese and mushroom in a snail dish, minus the snail – can’t go wrong. Matsutake is a small Japanese fungi, usually quite potent in flavour with a delicate fragrance, though it’s quite subdued when infused into the sponge. It worked well with the clear rosemary jelly and the silky cream helped to moisten up the cake. I quite enjoyed the subtlety of this dish. The charcoal tempura drizzled with gold paint looked… interesting, I guess they were striving for the black shiny stone look. The batter was paper-thin and greaseless, unfortunately so was the eggplant and apple so it was like eating very crispy paper; the citrus sesame dressing was delicious, like yuzu but slightly punchier. The soup course was lacking surprise; each soup was good and tasted as it should. The mushroom soup was probably the least interesting; tomato broth was marginally better with a swimming dumpling. This soup won the best presentation. It resembled slow-cooked Chinese soup, the taste was clean and crisp with hints of fruity sweetness. I have had quite a few truffle risotto, and strictly speaking this is ‘risotto with one small flake of truffle’; there was no trace of truffle fragrance at all – it was purely for illustrative purpose. I prefer my risotto in a thicker consistency, this version was quite watery and was not dissimilar to mushy rice. I think the kitchen could have done better, though the mouthfuls with mascarpone was delicious. This chunky blocks of monkey mushroom is the closest texture to meat, like braised lean meat. Despite the juiciness, it was still quite a grisly fungi, partly due to its thickness; Mama Chan took her time chewing through the well-seasoned blocs. The ravioli were good, though again, slightly overcooked; I preferred the pumpkin ones as they had a more distinctive flavour than spinach. The basil cream sauce was beautifully rich and thick, Papa Chan really enjoyed it. My trio of tasters was probably the least substantial main. Despite the enticing presentation, it was quite disappointing. The asparagus was just asparagus on a bed of mash; the quinoa was exactly how you’d expect quinoa to be, mixed with small cubes of mushroom; the risotto ball was undoubtedly the best of three, where pumpkin and mild curry flavours complimented each other, packed with some stretchy cheese in the middle. Both Papa Chan and I went for cheesecake. It was a good cheesecake. This was really good. The custardy egg was infused with small bit of truffle, the fragrance was remarkable. While Papa Chan and Auntie Amy decided to go for boring coffee, Mama Chan went for a refreshing pot of iced apple tea. Delicious. And I finished with another iced drink served in test tubes, on ice. In general we all enjoyed our lunch at Joie. I believe the alluring presentation made a huge contribution, as well as the excellent service, perhaps even more than the food itself. The ingredients were quite repetitive; various kinds of mushroom and pumpkin appeared multiple times throughout the courses. It’s somewhat understandable, especially when Singapore isn’t known for its wealth of food resource. I think the kitchen did well to deliver a relatively wider range in the menu. It was still more style over substance - totally up Mama Chan’s alley. Me? I would probably still prefer a good burger. Oh, and no one noticed there was no meat. There was no shortage of choices when it comes to restaurants in Bangkok. After crossing out Japanese, Korean, European and chains (it was only Day 2 in Thailand, we weren’t Thai-ed out), the list was somewhat shorter. Soul Food Mahanakorn came up on a few bloggers’ recommendation list, and the menu looked promising. Nested in an abundance of Japanese bbq restaurants, hostels and massage parlours, SFM was a short walk from Thong Lo BTS station. We booked a table for 8:30pm after an excellent massage at Diora, and the place was still packed – 90% of clientele was tourists / foreigners. I might have missed a trick by just reading travel blogs (– doh! what was I thinking). I was thankful when the waitress led us upstairs near the window, as the ground floor absolutely stank of sewers from the toilets. No idea how the other diners managed to eat through the stench. We started off with a couple of cocktails. His Sour Punch was refreshing though too bitter for my liking, preferred my Jai Yen Yen with passionfruit sweetness. For some reason we were struggling with the menu despite the variety; perhaps we weren’t hungry or we were trying to avoid items geared towards Westerners. And no, we weren’t going to choose a Burmese curry. The thick strips of aubergine were plump with savoury and tangy dressing, smoked to spongy softness. The soft boiled duck eggs with the gooey, candied yolk accompanied the juicy veg perfectly, adding more texture to the strong flavours. This was our favourite. We didn’t expect this to be served as individual components, it was almost like Vietnamese dishes – makes it sharing and the assembly quite tricky on our small plates. The fish and crab have dissolved in the thick curry, leaving it quite sparse of substance. The taste of crab roe was very prominent, however, with its distinctive rounded creaminess and deep richness. It’s not everyone’s cup of tea though; though I quite enjoyed it, it could have been better. This reminded me the Korean chicken that have taken over the world; large chunky pieces of chicken with bones deep-fried in a seasoned crunchy coat, served with a sticky dip. The meat was succulent and well-seasoned even under the batter, and can’t really go wrong with the distinguished Thai sweet & spicy sauce. 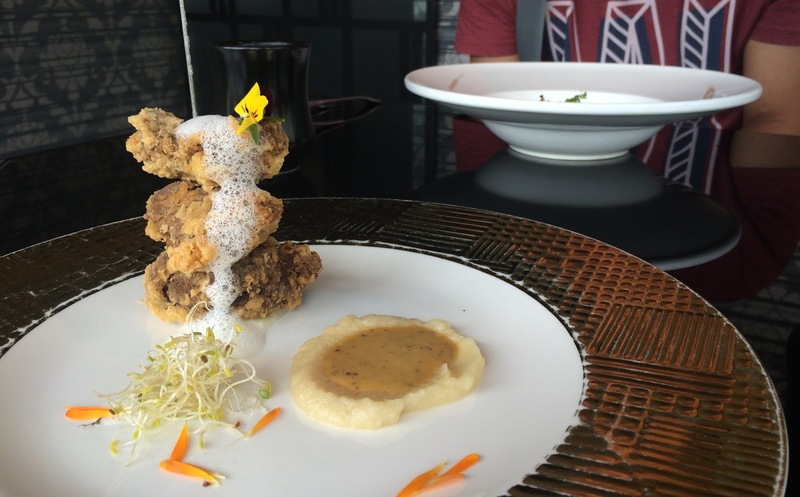 It was good, but nothing special – fried chicken afterall right? The rationale for the pickled watermelon rind is related to Asian wisdom, where deep-fried and baked food are thought to increase ‘fire’ within our bodies, and disrupts the balance of elementary forces within us. The rind is thought to extinguish the flames and keep our bodies balanced. We didn’t try their famous coconut ice cream, coz he doesn’t like coconut and we wanted to check out a night market. Overall SFM was good; plenty of variety and the food was packed with flavours, though familiar flavours I would add. Given it targets tourists and foreigners, the heat and spice level was also tuned to Western palettes. Nothing wrong with that, just means it’s not that special as I could have this outside Bangkok. I suppose it’s a cool place to hang out with good cocktails, as long as they sort the toilet out.